We returned to Grace’s Barn again this year for Carols in the Barn, at the kind invitation of Michael and Frances Gray. Michael had got the whole thing ready with a huge red bale trailer for the stage and provided electricity cables from every direction – everything that we could possibly need. Keeping company with some huge bags of fertiliser did feel a bit 21st century but, accompanied by Duncan Gray’s two very accommodating fluffy girls (the sheep), and as soon as the actors had their wonderful outfits on and the readers started reading out the nativity story, we were all transported back to 1st century Palestine. A birth in difficult circumstances for a desperate couple which has resonated for so many suffering people over the centuries: if God himself can experience this, then He knows how I feel….. 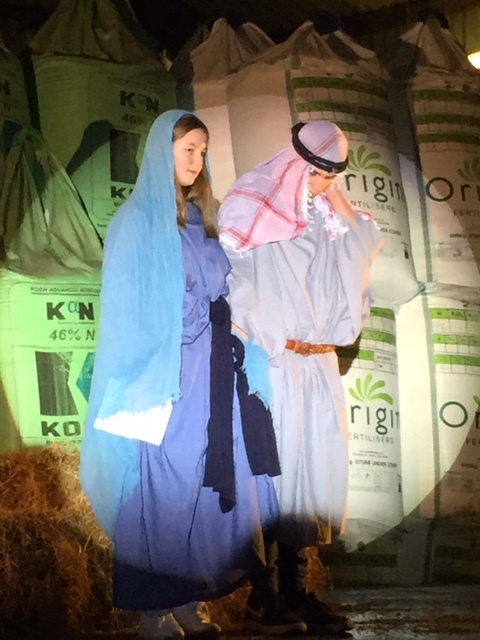 I sometimes wonder whether we should supply the dress for the wisemen but every year they come up with their own incredible creations – thank you to Steve, Peter and Morgan for doing this again this year – just brilliant! It is wonderful to belt out the carols and we are so grateful to Steve Abley for accompanying us all on the piano. The sound and the lights are essential on these occasions and we thank Robert Hall and Chris Ellis, fresh from the Easton Pantomime, for putting all their equipment together, lugging it over to Martyr Worthy and providing it for us again. A huge amount of work – thank you so much! Thank you also to our wonderful cast: Tim Clapp (the Innkeeper), Sophie Jennings (Mary), Jay Haskell (Joseph), Emma Claridge (Gabriel), Rob de Laszlo (Shepherd 1), Dominic Claridge (Shepherd 2), William Stubbs (Shepherd 3), Daniel Claridge (Shepherd 4), Peter McManus (Wiseman 1), Morgan Krone (Wiseman 2) and Steve Haywood (Wiseman 3). Thank you also to our readers Oliver Denniss, Lucy Pease, Alexandra Terhalle and Robert Hall. Its a dull job in the rain but so essential -thank you to Simon Ffennell and Patrick Appleby for organising the parking. One moment there were 100 mince pies and then there were none….so I guess we had about 100 people at Grace’s Barn and then there was the wonderful hot mulled wine and, for those of us who were not drinking,….Ribena! Thank you so much to Gilly Greenwood and Verity Coleman for organising the mulled wine and to Judith Mezger for organising the mince pies.